Cepage is a 1-Michelin star French restaurant in Hong Kong located up a very steep lane at the western end of the Wanchai district just next to Pacific Place 3. It has now become our favourite restaurant in Hong Kong. Although its 'parent' restaurant, Les Amis in Singapore, has never really caught on with us, we have immensely enjoyed our few dining experiences at Cepage. We really like the location and interior of this restaurant. Location-wise it is just off the main business district (though near enough for a reasonably pleasant walk from Central during the cooler months) and in the hip and cool new stretch of Wanchai. We've had lunch and dinner at this restaurant; during the day, the tables are bright and there is a sophisticated but relaxed feel about the place, and at night, the restaurant is well-lit and classy. We have some nostalgia about the area as we lived up the street for a short period of time over 10 years ago when this part of town was still undeveloped. We were here for lunch this time. 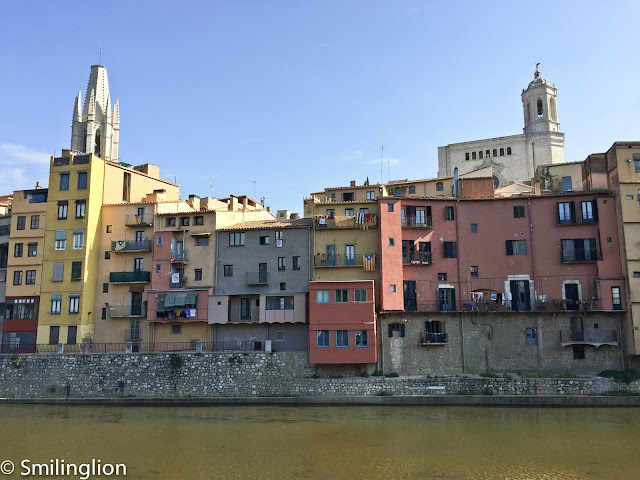 Unfortunately, on the day we came, the elevator broke down and we had to be led through the back entrance, walking past a rubbish dump area, up a stairwell and then through the kitchen. It was a warm day and it wasn't a pleasant trek through the back, but the staff members were apologetic and nice about it. We started off with some iberico ham (Cinco Jotas) which was very nicely smoked and tender. This went very well with our toast and the 2006 Cloudy Bay Te Koko Sauvignon Blanc. 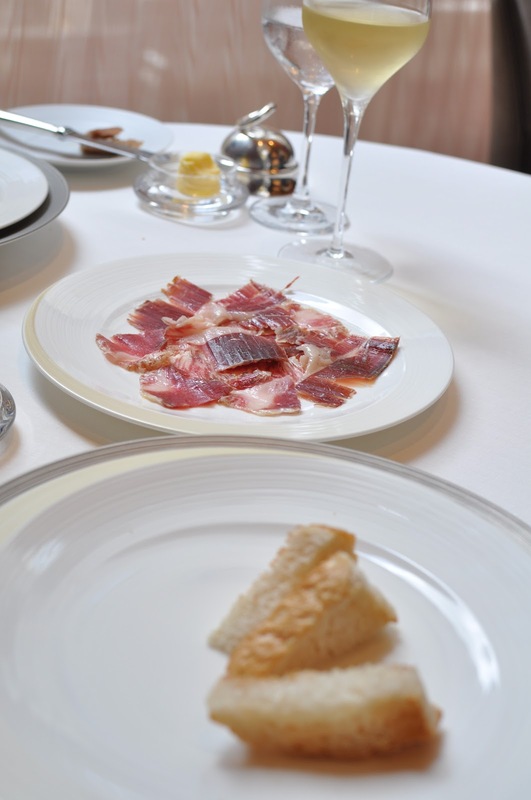 The spanish ham was a very nice touch for Cepage; it's a real treat to start a meal with it. It must be a bit of a fixture for them as we had this the previous time we were there as well. After the amuse bouche of the white asparagus mousse, we started the meal with the foie gras with summer fruits for me and the panfried japanese organic egg with pata negra ham for my wife. The foie gras was seared to perfection and the accompanying fruits were nicely caramelised as well. Did not find a single unremoved vein, which pleased me too (you'd be surprised at how rare this is, I recently dined at Jean-Georges in New York, a 3 star restaurant, and the foie gras was so veiny that I couldn't really eat it). The egg was also very good, coming together well with the ham and asparagus. For the mains, I ordered the black cod wrapped with Hooba leaf with Japanese ginger and cooked in miso, and my wife, the pan fried quail with truffle green salad. The cod was very nicely baked and was juicy on the inside, with the rich miso sauce a good marinate for the fish. The quail was tender and not over-cooked, and the chef was generous with the truffle shavings on the salad. We each had a glass of 2005 La Fleur de Bourd which was a classic Bordeaux of a vintage which was initially overhyped but still very good to drink. For dessert, I had the apple crumble with Tahiti vanilla ice-cream, which was very good, and my wife had the very interesting pineapple carpaccio and strawberry sorbet. In writing this blog entry, I have struggled to find more to write about the food at Cepage. To be honest, we don't remember much of the details of what we ate there, though we do remember that we had a great meal and a wonderful time. Much of this is due to the sheer simplicity of the cuisine yet the well execution of fresh and good ingredients made it a very satisfying meal. If we were living in Hong Kong now, this would be our 'comfort food' fine-dining place.